This is Part 10 of a 15 part series. If you have not yet read the previous articles, I suggest you begin with Part 1. 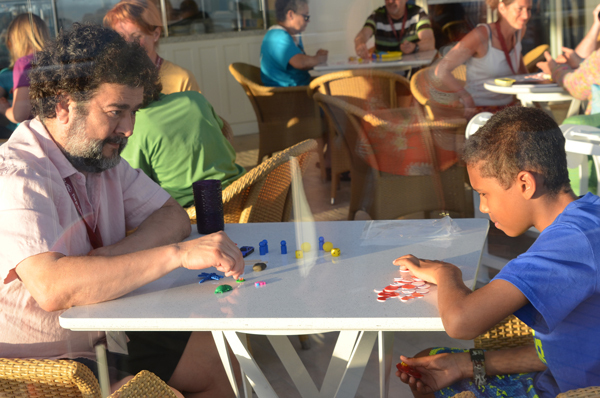 Jesús and the son of one of the conference attendees playing PORTL during the Five Go To Sea cruise. PORTL evolved out of Genabacab, a table game Kay Laurence developed for teaching shaping. Genabacab has very few instructions and really only one rule: the only person who is allowed to talk is the learner. The trainer and spectators are not to give any verbal hints or to discuss what is going on until afterwards. The table game lets you work out shaping plans BEFORE you go to your animal. Do you want to learn how to attach a cue to a behavior and then change that cue to a new cue? You can work out the process playing the table game and spare your animals the frustration of your learning curve. Kay has described workshops at her training center where someone arrives with a “how do I teach this?” type of question. Maybe the handler wants to teach match to sample, or she wants to see if her dog can indicate which object is the biggest one in a set. Instead of going straight out to the dog and confusing it with missteps and false starts, everyone in the group will pull out their Genabacab games. They will spend hours happily absorbed in developing the best teaching strategies for their dogs. Their dogs, meanwhile, are spending the day relaxing while their people work away at the puzzle. It’s only once the process is well understood, that the dogs are brought in for training. Jesús has been using Genabacab to help his students understand the concepts of learning theory. He wants to bring the game to the scientific community as a research tool, so – with Kay’s blessing – he has renamed it. It is now PORTL – Portable Operant Research and Teaching Laboratory. Animal studies are increasingly difficult to do. They are expensive, and there is always the question of ethics. How fair is it to run studies on lab rats? PORTL is a much better solution. You can have a question about how a particular process works, design an experiment using the PORTL game, and in the course of an evening have gathered enough data playing the game with a group of undergrads to write a paper – all without frustrating a single lab rat. Now that’s progress! Jesús’ students meet on a regular basis to play PORTL games. In his talk he showed some videos that illustrated beautifully how he used it to ask questions about regression and resurgence. In one video two tasks were taught. First, the learner was shaped to place one hand over the other – right hand over left, and then to reverse it – left hand over right. The behavior was put on a fixed ratio of 5. That means the learner was clicked and reinforced on every fifth swap of hands. The trainer then increased the ratio for the tapping to 30. The learner began to tap the block, but now there was no click and treat after 5 taps. The learner kept going to about 13 taps. At that point she began to experiment. She reverted back to swapping hands. Then she tried a few more taps, before going back to hand swaps. She tapped the block a few more times. The trainer was still keeping track so each of these taps was counting towards the count of 30 she was looking for. In the twenties the learner began to be creative. She tried different ways to move hand over hand. She’d go back and forth between experimenting with hand swaps and tapping the block. Finally she reached a count of 30 at which point her handler clicked and reinforced her. Jesús’ point is now all the extra gunk was also chained in. If the handler were to keep reinforcing the tapping of the block, she would also see the frequency of the hand swapping skyrocket. That’s not the desired, goal behavior, but it would increase right along with the tapping. Now you are probably thinking: “Well that’s just poor training. No one is going to jump from a fixed ratio of 5 to one of 30.” My response would be to say that this can happen inadvertently. Suppose a handler has had a behavior on a high rate of reinforcement. He’s asking the horse to carry himself in a correct bend. He’s cueing it through gentle requests down the rein. The horse is responding on a consistent basis, but then he’s distracted or the footing changes so he loses his balance. Whatever the reason, the handler isn’t getting the same consistent response. Instead he’s getting a string of unwanted behavior. Sometimes the horse almost meets criterion, but not enough to click. And then he comes through with the right answer. The handler captures that moment with a click and a treat. The question is: what is the long term result of that click? Has the handler just identified a single clickable moment or has he chained in a long string of unwanted behavior? The horse’s future responses will answer that particular question, but Jesús response in general is: if you want clean behavior, you need to learn to microshape. Jesús made the further comment that this type of inadvertent chaining happens all too often when people are working with autistic children. The sad thing here is the previous behavior that is being reinforced is not something harmless like hand swapping, but it’s often self-injurious behavior like head banging. To sort out the tangle you need to analyze the whole behavior chain rather than focus in on individual behaviors. These adjunctive behaviors can create a lot of stress. Again Jesús emphasized that’s why it is so important to understand extinction. You need to understand it so you can master it.